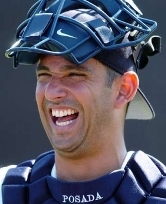 Jorge Posada is set to catch his 11th straight opener for the Yankees. In 2010, one Yankee will be making his 11th consecutive opening day start at the same position. Since 1952, that is tied for the third longest such streak in team history (see list below). I am sure most of you have already guessed that the player in question is Derek Jeter. Of course, you would be wrong. Although 2010 will mark Jeter’s 14th opening day start at SS, that span was interrupted in 2001 when he was forced to miss the opener because of a strained thigh muscle. Luis Sojo filled in and went 0-4 as the Yankees beat the Royals 7-3. Jeter can take solace, however, because the captain will move within one of Mickey Mantle’s team leading total of 15 Opening Day starts. It’s one thing to crack the Opening Day lineup, but another to perform. Based on RE24 (Base-Out Runs Added), the best Opening Day in Yankee history (since 1920) was recorded by Yogi Berra. On April 17, 1956, Berra went 4-4 for a walk, home run, double and 5 RBIs. Meanwhile on the pitching side, Ron Guidry turned in the Yankees best Opening Day start, based on game score. On April 10, 1980, Guidry dazzled the Rangers by throwing a 2-hit shutout. In the game, Guidry walked none and struck out 4. 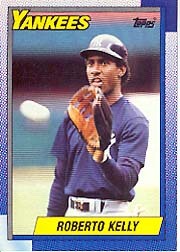 Roberto Kelly went 4 for 4 with a HR and 2 SBs on Opening Day in 1989. As for the team, the Yankees have gone 63-45-1 on the first day of the season, dating back to their origins as the Baltimore Orioles. On opening day against Boston at Fenway Park, the Yankees are 13-13, including a 5 game winning streak (1970, 1971, 1973, 1985, 2005) dating back to 1960.